WASHINGTON — Russian organized crime groups, flush with billions of dollars looted from the former Soviet Union and profits from drug trafficking and other criminal activities, are using unregulated and secretive Caribbean banks to launder their illicit gains, according to U.S. and Caribbean law enforcement officials. The billions of dollars now believed to be flowing through such offshore bank havens as Antigua, Aruba, the Cayman Islands and St. Maarten are difficult for authorities to trace because under these countries’ laws it is easy to open a bank, and depositor and transaction information must be kept secret. In some Caribbean nations, money laundering is not a crime. Barry McCaffrey, a retired general who was the Clinton administration’s anti-drug czar from 1996 to 2001, said he had seen estimates that up to $50 billion from the sale of narcotics, out of an annual world total of $500 billion, is laundered through the Caribbean, making it a “ferociously corrupting influence” in the region. And moving the money through banks with wire transfers is much easier than moving it physically. Anti-narcotics officials said moving the millions of dollars from drug sales is one of the drug dealers’ biggest problems. It is estimated that $1 billion in $100 bills weighs about 11 tons. Menatep, which a senior U.S. official said had a “horrible reputation” for alleged involvement with Russian organized crime, reportedly withdrew from backing the bank within weeks. But on Feb. 27, 1995, the Board of Governors of the U.S. Federal Reserve System, in a restricted memo, said it had been advised by the Bank of England that Konanykhine had visited Antigua in January 1995, “where he called on government officials to request their cooperation in keeping Menatep’s ownership of European Union Bank confidential.” By telephone from prison, Konanykhine denied asking that of Antiguan officials. Menatep’s president, Mikhail Khodorovsky, has denied it was ever involved in EUB or has any ties to organized crime. In a letter in March, Antigua’s Finance Ministry told the bank that it was “not in good standing.” It continues to operate, however. In June the ministry warned potential investors to “proceed with great caution,” according to bank documents. While the problem is said to be widespread, U.S. and British officials are focusing their concern over Russian organized crime activities on Antigua. Several Caribbean law enforcement officials said they no longer share narcotics or money laundering intelligence with the Antiguan government. “Everything we give them is compromised,” said one Caribbean official. The minimum amount necessary to open an offshore bank here is $1 million. Two interviewed bankers said virtually no checking is done on who the bank owners are — in part, they said, because the United States provides little information when banks ask for it. Fourteen nations in the wider Caribbean have been named by the US as “major money laundering” countries in the 2016 International Narcotics Control Strategy Report (INCSR) released by the U.S. State Department on Wednesday. 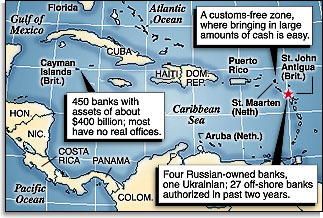 According to international law enforcement officials, the Russian mafia operates with impunity in the Caribbean despite the presence of the U.S. Virgin Islands and Puerto Rico in the mix. “Economic changes taking place in the former Soviet Union, coupled with United States sanctions in Iran are generating opportunities for money launderers to set up international criminal networks by using the burgeoning passport program in the Caribbean, not only as a gateway to the United States and Canada but as a means of bringing in “illicit dollars via licit means,” said Rebecca Theodore, who writes about international security out of Washington, D.C.
Antigua and Barbuda is an offshore center that continues to be vulnerable to money laundering and other financial crimes. Its relatively large financial sector and internet gaming industry add to its susceptibility. According to the Antiguan Office of National Drug Control and Money Laundering Policy (AONDCP), the collaborative efforts between Antigua and Barbuda and United States law enforcement agencies have brought about a decrease in drug trafficking activity. The Bahamas is a regional and offshore financial center. The country’s economy is heavily reliant upon tourism, tourism-driven construction, and the offshore financial sector. The Bahamas remains a transit point for illegal drugs bound for the United States and other international markets. The major sources of laundered proceeds are drug trafficking, firearms trafficking, gambling, and human smuggling. Money laundering trends include the purchase of real estate, large vehicles, boats, and jewelry, as well as the processing of money through a complex web of legitimate businesses and international business companies (IBCs) registered in the offshore financial sector. Drug traffickers and other criminal organizations take advantage of the large number of IBCs and offshore banks registered in The Bahamas to launder significant sums of money. Belize is not a major regional financial centrer; however, it has a substantial offshore financial sector. Belize is a transshipment point for marijuana and cocaine, and human trafficking is a concern. There are strong indications that laundered proceeds are increasingly related to organized criminal groups involved in the trafficking of illegal narcotics, psychotropic substances, and chemical precursors. The government of Belize continues to encourage offshore financial activities that are vulnerable to money laundering and terrorist financing, including offshore banks, insurance companies, trust service providers, mutual fund companies, and international business companies. The British Virgin Islands (BVI) is a UK overseas territory. The economy is dependent on tourism and the offshore financial sector. BVI is a well-established, sophisticated financial center offering accounting, banking, and legal services; captive insurance; company incorporation; mutual funds administration; trust formation; and shipping registration. The BVI is advertised as the world’s leading offshore centre with more offshore companies than any other country. As of September 2015, the banking sector has assets valued at $2.4 billion. The Cayman Islands, a UK Caribbean overseas territory, is an offshore financial center. Most money laundering that occurs in the Cayman Islands is primarily related to foreign criminal activity and involves fraud, tax evasion, and drug trafficking, largely cocaine. The offshore sector is used to layer or place funds into the Cayman Islands financial system. Due to its status as a zero-tax regime, the Cayman Islands is also considered attractive to those seeking to evade taxes in their home jurisdictions. Despite the government of Colombia’s fairly strict AML/CFT regime, the laundering of money, primarily from Colombia’s illicit drug trade and illegal mining, continues to penetrate its economy and affect its financial institutions. Money laundering is a significant avenue for terrorist financing in geographic areas controlled by both the Revolutionary Armed Forces of Colombia (FARC) and the bandas criminales (BACRIM). In 2015 there was a reported uptick in the use of dirty money to influence local and national elections. Transnational criminal organizations increasingly favor Costa Rica as a base to commit financial crimes, including money laundering, as a result of its geographic location and other factors, including limited enforcement capability. This trend raises serious concerns about the Costa Rican government’s ability to prevent these organizations from further infiltrating the economy. As Costa Rica has shifted from a transit point to an operations base for regional narcotics trafficking organizations, the laundering of proceeds from illicit activities has increased. Proceeds from international narcotics trafficking represent the largest source of assets laundered in Costa Rica, although human trafficking, financial fraud, corruption, and contraband smuggling also generate illicit revenue. In 2015, the head of Costa Rica’s intelligence agency, said that approximately $4.2 billion annually is laundered in Costa Rica. Curacao is an autonomous country within the Kingdom of the Netherlands that defers to the Kingdom in matters of defence, foreign affairs, final judicial review, human rights, and good governance. Curacao is considered a regional financial centre and, due to its location, it is a transshipment point for drugs from South America bound for the United States, the Caribbean, and Europe. Money laundering is primarily related to proceeds from illegal narcotics. Money laundering organizations take advantage of the availability of US dollars, banking secrecy, offshore banking and incorporation systems, two free trade zones (airport and harbour), an expansive shipping container terminal with the largest oil transshipment center in the Caribbean, and resort/casino complexes to place, layer, and launder illegal proceeds. Money laundering occurs through real estate purchases and international tax shelters. Laundering activity also occurs through wire transfers and cash transport among Curacao, the Netherlands, and other Dutch Caribbean islands and illegal underground banking. Bulk cash smuggling is a continuing problem due to Curacao’s close proximity to South America. The Dominican Republic (DR) is not a major regional financial centrer, despite having one of the largest economies in the Caribbean. The DR continues to be a major transit point for the transshipment of illicit narcotics destined for the United States and Europe. The six international airports, 16 seaports, and a large porous frontier with Haiti present Dominican authorities with serious challenges. Corruption within the government and the private sector, the presence of international illicit trafficking cartels, a large informal economy, and weak financial controls make the DR vulnerable to money laundering and terrorism financing threats. Guatemala is not considered a regional financial center. It continues to be a transshipment route for South American cocaine and heroin destined for the United States, and for cash returning to South America. Smuggling of synthetic drug precursors is also a problem. Reports suggest the narcotics trade is increasingly linked to arms trafficking. Historically weak law enforcement agencies and judiciary, coupled with endemic corruption and increasing organized crime activity, contribute to a favorable climate for significant money laundering in Guatemala. Haitian criminal gangs are engaged in international drug trafficking and other criminal and fraudulent activity, but do not appear to be involved in terrorist financing. While Haiti itself is not a major financial centre, regional narcotics and money laundering enterprises utilize Haitian couriers, primarily via maritime routes. Much of the drug trafficking in Haiti, as well as the related money laundering, is connected to the United States. Further, most of the identified money laundering schemes involve significant amounts of US currency held in financial institutions outside of Haiti or non-financial entities in Haiti, such as restaurants and other small businesses. A great majority of property confiscations to date have involved significant drug traffickers convicted in the United States. Illicit proceeds are also generated from corruption, embezzlement of government funds, smuggling, counterfeiting, kidnappings for ransom, illegal emigration and associated activities, and tax fraud. Panama’s strategic geographic location; dollarized economy; status as a regional financial, trade, and logistics center; and lax regulatory system make it an attractive target for money launderers. Money laundered in Panama is believed to come in large part from the proceeds of drug trafficking due to the country’s location along major drug trafficking routes. Tax evasion, financial fraud, and corruption also are believed to be major sources of illicit funds. Money is laundered via bulk cash and trade by exploiting vulnerabilities at the airport, using commercial cover and free trade zones (FTZs), and exploiting the lack of regulatory monitoring in many sectors of the economy. The protection of client secrecy is often stronger than authorities’ ability to pierce the corporate veil to pursue an investigation. St Maarten is an autonomous entity within the Kingdom of the Netherlands. St Maarten enjoys sovereignty on most internal matters and defers to the Kingdom of the Netherlands in matters of defense, foreign policy, final judicial review, human rights, and good governance. Money laundering is primarily related to proceeds from illegal narcotics trafficking. Bulk cash smuggling and trade-based money laundering may be problems due to the close proximity to other Caribbean islands and Saint Martin, the French part of the shared island, which is also a free trade zone. St. Maarten does not have an offshore banking industry. Many hotels operate casinos on the island, and online gaming is legal and subject to supervision. St. Maarten’s favorable investment climate and rapid economic growth over the last few decades have drawn wealthy investors to the island. Many invested money in large scale real estate developments, including hotels and casinos. In St. Maarten, money laundering of criminal profits occurs through business investments, purchases of real estate, and international tax shelters. Its weak government sector continues to be vulnerable to integrity-related crimes. Conditions in Venezuela make for ample opportunities for financial abuses. Venezuela’s proximity to drug source points and its status as a drug transit country, combined with weak AML enforcement and lack of political will, limited bilateral cooperation, and endemic corruption, make Venezuela vulnerable to money laundering and financial crimes. The porous border between Venezuela and Colombia has also created a burgeoning black market. Furthermore, Venezuela’s highly distorted multi-tiered foreign exchange system and strict price controls open numerous opportunities for currency and goods arbitrage, including to facilitate money laundering. Although the Venezuela-Colombia border was closed in August 2015 under the auspices of the Venezuelan government’s “state of exception,” nevertheless a robust black market continues to function in the border regions. Colombian law enforcement and customs officials reported that more than 90 percent of commerce in the border region was related to black market goods and services. Illicit trade and illegal financial activity are common in the border regions. Laundered funds primarily come from drug trafficking, but informal traders offering products ranging from shampoo to gasoline are also profiting through currency manipulation. A series of recent US legal actions against Venezuelan citizens have exposed questionable financial activities related to money laundering and terrorism finance. Money laundering is widespread in Venezuela, and can be seen in a number of areas, including government currency exchanges, commercial banks, gambling, real estate, agriculture, livestock, securities, metals, the petroleum industry, and minerals. Trade-based money laundering remains a common and profitable method.